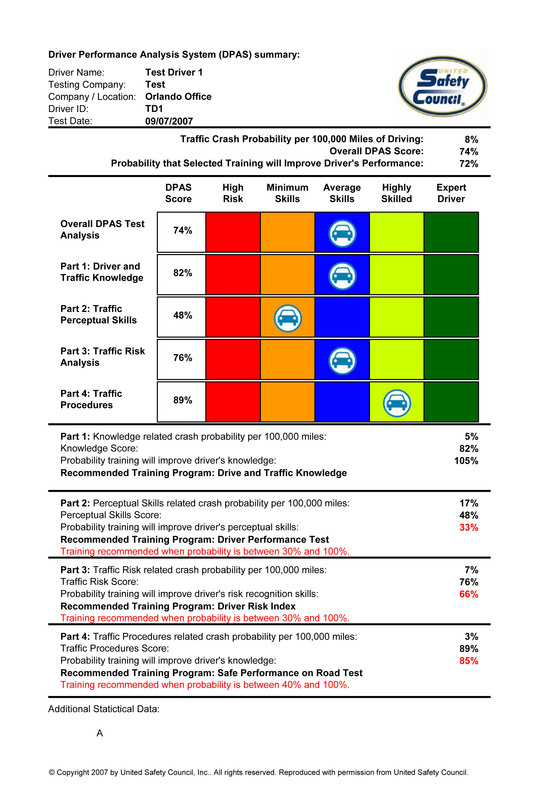 Leveraging an all-online video format, the 30 minute DPAS evaluation presents 100 crash-related driving scenarios. People taking the evaluation, view a scenario, listen to a statement regarding each scenario and agree or disagree with the statement, within five (5) seconds. The confluence of crash-contributing scenarios and the rapid decision making requirement, emulates critical aspects of "real-world" driving and accurately projects an individual's likelihood of being involved in a crash. The results include a detailed report by individual driver evaluated as well as an export file for an entire organization. Results are generated by analyzing the interdependence in responses and utilizing more than 300 underlying formulas that define the complex relationship among variables that contribute to crash probability. For 25 years DPAS has been providing business and government with a proven ability to accurately assess individual driver knowledge and behavior and project individual crash probability. The DPAS platform has been utilized by insurers, fleet operators, and all types of businesses to measure the driving knowledge, behavior and related risks of individuals (including: Insure's, employees, prospective hires, etc.) and project their probability of being involved in a crash. DPAS was developed by internationally respected, driving safety expert Dr. Jack K. Weaver, Ph.D. Historically delivered via in-person completion, DPAS 7.0 brings all the proven capabilities of DPAS together in an all-online platform, suitable for any size or type of organization. DPAS 7.0 is offered exclusively by the United Safety Council. The United Safety Council is a not-for-profit 501(c)3 organization that has been making the world a safer place since 1953.